This weeks we have a very popular classic roast with a modern day spin. Eight O’clock coffee has been in our kitchens for years but, now you can enjoy this amazing roast with a hint a hazelnut flavor brewed with Keurig’s modern technology! The best news is- it is on sale! Wacky Wednesday Weekly Coffee Sale! Every Wednesday we will post a totally wacky sale price on a variety of coffees including Keurig Kcups. Your readers will love these prices and dont forget shipping is free when you spend $59. or more! 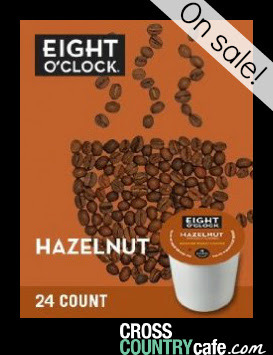 Eight O’clock Hazelnut Keurig K-cup coffee is on sale for $11.99 per box of 24! A medium roast, flavored, 100% Arabica bean coffee. 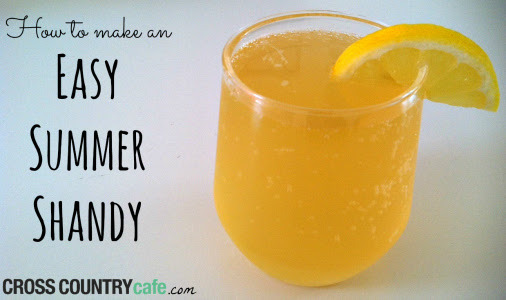 This coffee offers amazing aromas and a silky sweet taste. Diedrich Rio Blend Keurig K-cup coffee is on sale this week for $9.99 per box of 24! 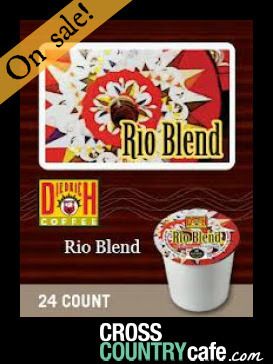 Get yourself ready for a carnival with these Rio Blend K-Cups from Diedrich. This K-Cup boasts a smooth, creamy body with hints of spice, raisins and cocoa. It is a well balanced medium roast that will put you in the mood for dancing. Sale runs Wednesday June 25th through Tuesday July 1st at midnight EDT.